check out this POST or this POST! 2. Listened to: "Friday, I'm in Love" by Draden Mitchell — it's on a reggae/love CD Daniel made for me. 4. Purchased: Purple Michael Kors glasses... since I now have an astigmatism. Get used to seeing me in glasses! 9. Prayed for: Myself! Will you please pray that I will be given an opportunity if it is right for me?... (and that's all I can tell you at this point in time, the rest will come later if it happens!). 10. Painted on my nails: Mardi Gras themed green nails! 11. Craved: Jumbo popcorn chicken from Sonic... and I'm not even sure if it's good... but it sounds good. 12. Wished for: The weekend! Surprising my dude and snuggling in bed this morning was so warm and cozy... I just wanted to stay there all day! 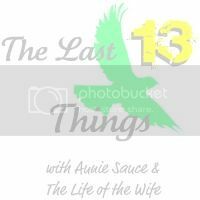 Now, go visit The Life of the Wife to see her 13 things! Then tell us... what are the LAST 13 THINGS you did? Email me for next week's topic! Join the Party! I'm obsessed with your nails! LOVE YOUR LIST..so cute Ann! I wore contacts for years, but have been rockin glasses every day for the past few months. Love Rocket Dog shoes - have a pair on now. LOVE those catbird rings. Found something super similar HERE http://www.etsy.com/listing/86111134/secret-love-sterling-silver-stackable and way cheaper. Let me know what you think! Just found your blog and I'm a new follower already! I think it's so cute :) Now off to write my own 13 Things so I can link up!! LOVE the nails!!!! So cute!!!! love the mardi gras nails! and i definitely remember that song from 50 first dates. love! 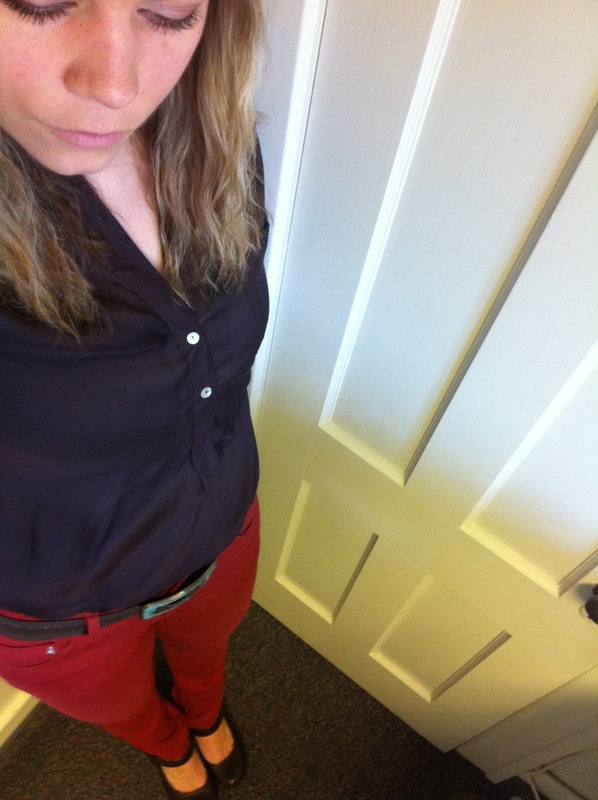 You pull of the red pants well! loved this fun link up! Yay for all the girls with an astogmatism. Totally agree with Lindsay, love myself in glasses. i feel I look odd when I wear my contacts. Love the list of links can't wait to look at them all. One question though, what type of store is Sonic, we don't have that here. 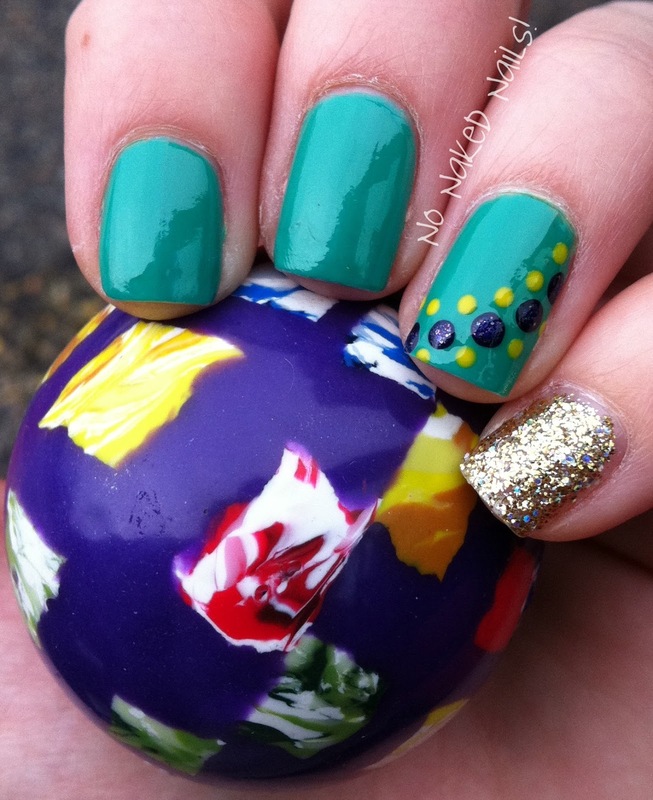 I am IN LOVE with your Mardi Gras nail! Too stinkin cute! I have an astigmatism too! It's only in my left eye. I wear contacts and it's so weird cause they are two different ones and one is thicker than the other. It was a pain to get ones that worked. I think I tried on 10 pairs! Cute nails! I adore yours and Jenna's new linkup! I love your nails. I have an astigmatism too in my left eye. I wear contacts out, but have been wearing glasses more around the house. I have your button on my blog now.